Laser procedures in the field of dermatology and plastic surgery will continue to grow in importance in the future. It requires medical as well as general knowledge in laser engineering to repeat the benefits shown in clinical trials on laser in actual patients. D&PS publishes series of articles on the extensive and detailed views of an engineer, developer and manufacturer of lasers to provide doctors who use medical lasers with insightful tips. Starting with this article, we will cover all topics on the principle and application of laser as well as types of laser used in dermatology and plastic surgery. The below article was contributed by Dr. Chu Hong, an authority of laser engineering in Korea. Dr. Chu served as a senior researcher from 1985 to 2002 at Korea Institute of Science and Technology and has been the CEO of LASEROPTEK Co., Ltd. since 2000. The term ‘laser’ was coined from putting together the initials from ‘Light Amplification by Stimulated Emission of Radiation.’ The direction, frequency, and phase of the light created by stimulated emission, that is the photon, is completely identical with those of the incident photon stimulating emission of radiation. Therefore, laser has excellent collimation, focus, and coherence as well as very high brightness. a)Niels H. D. Bohr (1885-1962): Bohr was a Danish physicist who contributed greatly to the advancement of quantum mechanics. In 1913, Bohr was able to accurately demonstrate the spectrum of a hydrogen atom using the hypothesis on a new atomic orbital and emission of photons, on which the new theory of quantization of matter was founded. This achievement won him the Nobel Prize in Physics in 1922.
b)Einstein (1879-1955): Einstein was the most respected physicist and intellect of the 20th century. He proposed revolutionary theories such as special theory of relativity, photoelectric, Brownian movement, and general theory of relativity, etc. and won the Nobel Prize of Physics in 1923. Einstein provided a more systematic analysis of the hypothesis involving Niels Bohr’s atomic model. The hypothesis posits that an electron can jump between quantized orbits by absorbing(induced absorption) or emitting(spontaneous emission) a photon. In Bohr’s frequency condition, atoms’ emission of light in high energy levels was not related to the existence of external light. In 1917, Einstein suggested that a second possibility of light emission was needed considering the thermal equilibrium. This introduced the concept of stimulated emission, light emission from the influence of surrounding light. At the time, this was a groundbreaking idea. Along with this concept of stimulated emission, Einstein was able to establish a comprehensive theory on the light absorption and emission of the atom and this provided an essential step toward invention of laser 40 decades later. Einstein incorporated the new concept of stimulated emission to Bohr’s hypothesis of the interactions between light and the atom (stimulated absorption, spontaneous emission) and discovered an important basic principle of laser. When Einstein theoretically demonstrated the existence of stimulated emission as part of the interaction between light and matter in 1917, he laid the conceptual foundation for introduction of laser. However, there were no practical methods to empirically prove this idea and only 40 years later, in 1953, C.Townes and A.Schalow of the Bell Lab in USA empirically demonstrated for the first time that stimulation emission from ammonia gas (NH3) to microwave (24GHz) was possible. In 1958, Townes and Schalow went on to show that light amplification through stimulated emission was possible in the visible light range. In 1960, T. Maiman at Hughes Research Laboratories brought into existence red ruby laser in the visible light range of 694.3nm. He inserted a synthetic ruby crystal created from dopping a small amount of chromium in aluminum oxide crystal( sapphire) in the center of a spiral-shaped flashlamp. By supplying high electric voltage and creating a spark across the electrodes in the flashlamp tube, he could input strong light into the ruby and succeeded in laser oscillation. This achievement led Townes to be jointly awarded the Nobel Prize in Physics in 1964 with Russian scientists Basov and Prokhorov. In 1961,immediately after ruby laser oscillation, oscillation of the world’s first gas laser, helium-neon laser (He-Ne Laser) was achieved by Javan, etc. Following this, research on laser saw explosive growth and by 1960s, most of the important lasers used today were developed. In the 70s and 80s, applied research on laser flourished and laser now took on a more important status in various areas and applications. Laser beams have three unique characteristics that set it apart from the natural light or lamp light; monochromatic, coherence, and collimation. Due to these characteristics, laser is being used extensively in various fields of medicine and industry. Therefore, accurate understanding of each of these properties of laser is necessary to find appropriate use of the laser. As laser is a tool, without the knowledge of the tool, predicting the results of using this tool becomes difficult. The following passage explains the unique characteristics of laser that are not found in general sources of light. The laser beam is single-wavelength, unlike other types of light and progresses straight forward without dispersing. Light from a burning material or light from fluorescent lamps are emitted from heated atoms or naturally created from individual atoms. This type of light, although originating from the same type of atoms or molecules, contains lights of widely different wavelengths. The light emitted from individual atoms or molecules is a collection of different lights that are not correlated to each other. However, the laser beam is monochromatic with a single wavelength and is continuous light with an even phase. Observing the spectrum of this light through a dispersing prism shows a very thin line spectrum on the screen. In other words, the laser beam is monochromatic with identical phase and it is also called coherent light or light with high coherence. Using a lens, the laser beam can be focused into a light beam of very small area (small enough to be measured by the wavelength). Using this monochromatic characteristic, the laser can be selectively absorbed, reflected and transmitted on a material. 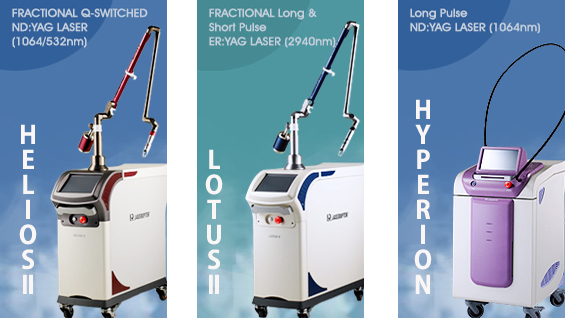 For example, a medical laser, especially Q-switched Nd:YAG laser used in dermatology is easily absorbed in black and dark brown in the wavelength of 1064nm but is not readily absorbed in and penetrates other colors. That is, this laser does not respond to other pigments. Thus, the 1064nm wavelength is used to remove tattoos or pigmentary lesions such as melasma. In addition, the wavelength of 532nm is readily absorbed in yellow, red, dark brown, and blue, etc. making it ideal for treatment of Ota’s nevus and Becker’s nevus, etc. In order to treat pigmentary lesions, the knowledge of the pigment and the type of laser that is absorbed into that pigment is crucial for optimal treatment effect. Coherence refers to the degree of the wave phases that are in constant relative phase spatially and temporally. This is the most important property when it comes to application of light’s interference. In general, interference patterns are not visible with the light seen in everyday life, that is the sunlight or light from bulbs, as it has very low coherence. Coherence can be largely categorized as spatial and temporal as below. 1) Temporal coherence: the correlation of a light wave’s phase at different points along the direction of propagation of light. This is a measure of how close the light source is to single-wavelength(monochromatic). 2) Spatial coherence: the correlation of a light wave’s phase at different points transverse to the direction of propagation of light. This is a measure of how uniform the phase of the wavefront is. Laser is in essence coherent, though in differing degree depending on the structure of a resonator. If the output of the laser is single mode, spatial coherence can be secured and the degree of temporal coherence depends on the wavelength bandwidth (△λ) of the laser. The degree of temporal coherence is also known as coherence length (Lc= λ2/△λ). This is related to the fact that temporal coherence is often used to create interference and interference is not observed in structures with larger optical path difference than this coherence length. Using this coherent property, measuring devices such OCT (Optical Coherence Tomography) can be operated for precise measurement of skin tissues. As only the light beam going parallel to the optical axis determined by the opposing mirrors (full reflection and partial reflection mirrors of the laser resonator) is amplified, it is collimated, or has linear progression in one direction. This property differs from thermal-radiated light that travels in all directions. Due to collimation, the laser beam can be used for precise alignment and it is possible to irradiate the laser beam accurately on the desired area using the reflection mirror. However, laser beam has the characteristics of a wave and can be affected by diffraction which results in some degree of divergence angle. The divergence angle differs depending on the structure of a resonator. In case of a gas laser (CO2 laser, He-Ne laser, etc.) the divergence angle generally does not exceed 1 mrad (0.05o). Using a lens, a laser beam with strong collimation can be focused into a very narrow light (narrow enough to be measured by the wavelength), which allows maximal energy per unit area (Joule/ cm2) or power per unit area (Watt/ cm2) on the focal plane. On the contrary, the normal light travels in many different directions from the light source, creates light source image near the focus and cannot be condensed into a narrow beam using a lens. To minimize the light source image appearing near the focus, the lens should be placed infinitely far from the light source or the light source should be reduced to as small as a dot. However, this greatly weakens the light intensity. Therefore, it is very difficult to collect large light intensity into a small point using the normal light. As this is possible with the laser beam, it can be used to focus energy within only a few um of diameter for precision cutting of the skin or bone.